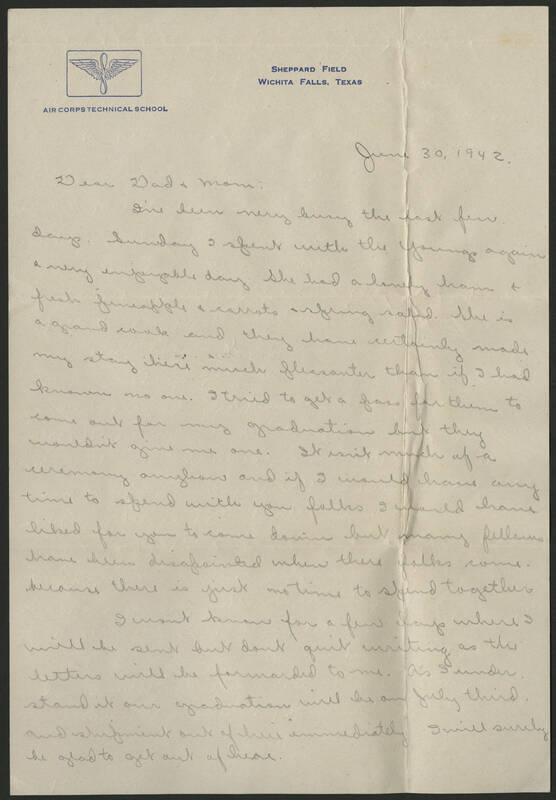 June 30, 1942 Dear Dad & Mom: I've been very busy the last few days. Sunday I spent with the Youngs again a very enjoyable day. She had a lovely ham & fresh pineapple & carrots spring salad. She is a grand cook and they have certainly made my stay here much pleasanter than if I had known no one. I tried to get a pass for them to come out for my graduation but they wouldn't give me one. It isn't much of a ceremony anyhow and if I would have any time to spend with you folks I would have liked for you to come down but may fellows have been disappointed when there folks came because there is just no time to spend together. I won't know for a few days where I will be sent but don't quite writing as the letter will be forwards to me. As I understand it our graduation will be on July third and shipment out of here immediately I will surely be glad to get out of here.